DIRTY COP MUELLER FEELS HEAT -- Announces Arrests -- THROW DIRTY COP MUELLER IN SLAMMER! 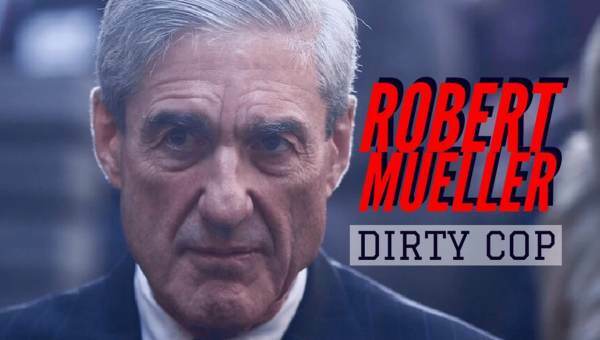 DIRTY COP MUELLER FEELS HEAT — Announces Arrests — THROW DIRTY COP MUELLER IN SLAMMER! It is being reported tonight that corrupt and criminal former Head of the FBI, Robert Mueller, will announce charges being filed as a result of his investigation into the fake news Trump-Russia collusion investigation created by corrupt and criminal deep state, their MSM and fellow Democrats. These charges are announced as calls for Mueller’s recusal are finally making the news. Mueller is announcing these charges because he is under such pressure to step down. There is no reason for his investigation and Americans know it. Mueller’s announcement is just to change the discussion and narrative in the fake news MSM. Dirty and corrupt Democrats never recuse themselves from obvious conflicts of interest when required by law. Robert Mueller is example number one. He should recuse himself from the fraudulent special investigation he is overseeing and then he should be disbarred, prosecuted and punished. The law governing the special counsel (28 CFR 600.7) specifically prohibits him from serving if he has a conflict of interest in the case. The rule has been interpreted to mean that even the appearance of a conflict is sufficient for disqualification. A conflict of interest is a situation in which an individual has competing interests or loyalties. The conflict itself creates a clash between that individual’s self-interest or bias and his professional or public interest. It calls into question whether he can discharge his responsibilities in a fair, objective and impartial manner. Special Counsel Robert Mueller has a problem: He has a disqualifying conflict of interest regarding a large part of his work. It involves a choice between investigating or relying on former FBI director James Comey, a longtime close friend of Mueller’s. Ideally, he’ll recognize that and resign. But if he doesn’t resign, Attorney General Jeff Sessions should appoint another special counsel to take over the obstruction-of-justice part of the investigation, where Mueller is disqualified. Instead of recusing himself Mueller has brought in an army of former Hillary and Obama attorneys to assist him in the phony Russia scandal that never should have been implemented in the first place. This past week information was reported that prior to the Obama administration approving the very controversial deal in 2010 giving Russia 20% of America’s Uranium through the approved sale of Uranium One, the FBI had evidence that Russian nuclear industry officials were involved in bribery, kickbacks, extortion and money laundering in order to benefit Vladimir Putin, says a report by The Hill. Mueller was the head of the FBI at this time! We found out that the investigation was supervised by then-U.S. Attorney Rod Rosenstein, who is now President Trump’s Deputy Attorney General, and then-Assistant FBI Director Andrew McCabe, who is now the deputy FBI director under Trump. Sara Carter of Circa News interviewed Victoria Toensing, a lawyer for an FBI informant who said her client “is not only afraid of the Russian people, but he is afraid of the US government because of the threats the Obama administration made against him.” The individual in question faces criminal charges put in place by Obama’s Justice Department if he talks about the FBI investigation. By not stepping down Mueller further shows that he is indeed a bad cop. A person of integrity would easily see his conflicts of interest and would recuse himself. Many professions have rules and guidelines that encourage or mandate that an individual step down or aside when they have clear conflicts of interest or even the appearance of a conflict of interest. The legal system is more strict in definitions and actions to be taken.